In an account of the U.S. role in the Middle East, Three Kings is an “erudite, persuasively argued, and lucid” (Publishers Weekly) narrative of America’s deep and tangled relationships in the region. 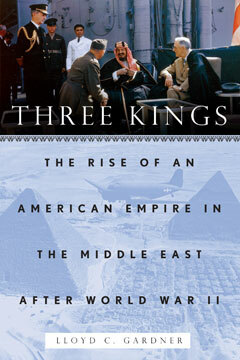 Three Kings reveals a story of America’s scramble for political influence, oil concessions, and a new military presence based on airpower and generous American aid to shaky regimes in Saudi Arabia, Iran, Egypt, and Iraq. Deftly weaving together three decades of U.S. moves in the region, Lloyd Gardner delves into early American efforts to support the influence the Saudi regime (including the creation of Dhahran air base, the target of Osama bin Laden’s first terrorist attack in 1996); the CIA-engineered coup in Iran; Nasser’s Egypt; and, finally, the rise of Iraq as a major petroleum power. As American policy makers and military planners grapple with a radically new and rapidly shifting political landscape in this vital region, Gardner uncovers “valuable new factual evidence . . . ably guid[ing] the reader through the perilous chess game that has played out in the region since World War II” (Kirkus Reviews).